Many of my blog posts comes from personal real world needs, since many of them requires more than just an internet search, when i struggle with some of them I try to share my experience with the online community. 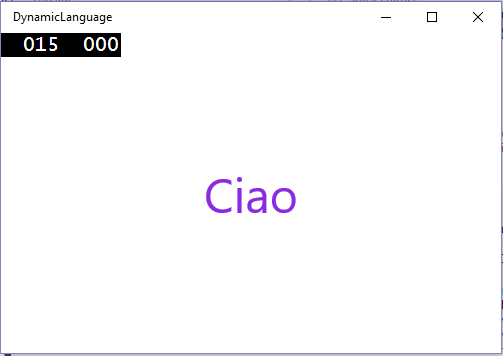 Following the MSDN documentation I’ve created two projects: A UWP client (LocalizationInLib) and a control library project (ControlLibrary) inside the latter I’ve created a Strings folder containing the default localization file Resources.resw and inside of it an additional “it” folder containing the italian translation of master Resources.resw content. Nothing new until now if you read the previously mentioned MSDN link. 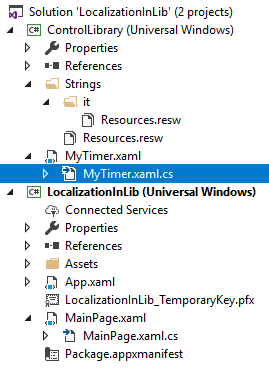 Let’s now define our simple MyTimer control in XAML and a SetLanguage method that accept the control culture to use. 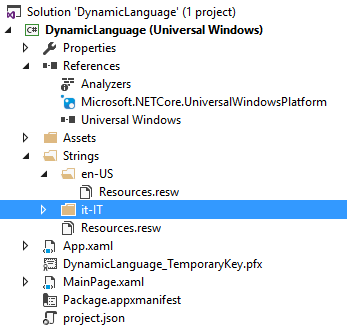 This way we can invoke SetLanguage from the client application depending of what culture the user selected in main app. 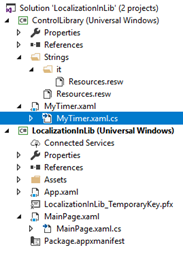 Important detail is to use the proper namespace inside GetForViewIndependentUse otherwise the method will fail. Just few lines of code, but took me some time to figure out how to properly combine them, so I hope this will help you in future. Localizing a Windows Store app is a fairly easy task thanks to the x:UId attribute introduced with WinRT. 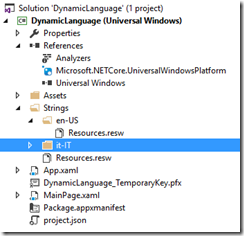 If you need to create a Multilanguage application just add to your Visual Studio solution a folder named Strings and below it add a folder for each language you want to support using the two letter ISO language as name. Inside each folder I’ve added a resource file and note that there’s a Resource.resw file just below Strings folder, it represent the default fallback resource language file that will be used in case your app will be executed on a system whose language is different than America English or Italian. Note the trick of using “Item” as property name to signal that the class indexer has changed. So let’s bind TextBlock’s Text property to viewmodel indexer using this syntax, and you’re done. You can find a complete example here.